When you travel abroad, you probably pull out your credit card for most purchases. Using your credit card often is the easiest and safest way to pay, mainly because you have some options for contesting charges. However, you should be aware of the fees you will have to pay to use your card, and take steps to minimize those fees. When you use a credit card abroad, you almost always pay a currency conversion fee. This is the fee that the credit card issuer charges your bank to convert the charges into the currency of the country where you make the purchase. This charge is usually 1 percent of the purchase price. Your bank might tack on an additional 2 percent transaction fee. So, for example, a $200 hotel room actually costs you $206. Even a 3 percent fee is less than most currency exchanges charge for converting U.S. dollars into the local currency. Credit cards also usually give you a more favorable exchange rate than you would get at a currency exchange or from a local merchant. However, not all credit card issuers charge the same fees. And Capital One and some premier versions of other cards charge no fees at all for using their card abroad. 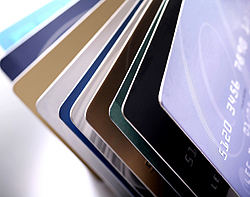 To see Bankrate.com’s list of the major credit card companies and their fees, click here. Before you go abroad, call your credit card issuers and ask about their international fees. Then you can use the card that charges the lowest fee. If you travel abroad a lot, you might want to get a card with no fees. Plan to use credit cards from a major issuer. Before you go, call your card issuer and ask for a customer service phone number you can use when you are abroad. The customer service 800 number printed on your card probably won’t work outside the United States. At the same time, tell them where you will be going, and when. You don’t want your credit card company to freeze your card because of unusual charges. Also, let your bank know if you plan to use your ATM or debit card overseas. Make sure any cards you plan to use will not expire during your trip, and check that you have enough left on your credit limit to cover what you expect to spend. Keep your receipts. That way, if you find you have been overcharged when your statement arrives, you will have proof to use to contest the bill. And while you’re at it, check the receipt before you leave the store.